Rarely does Sri Lanka convicts Buddhist monks. But few days back the courts in Sri Lanka made a history when it convicted Galagoda Aththe Gnanasara, the controversial leader of Bodu Bala Sena ( Buddhist Power Force) - who is referred to as 'Thero'- the venerable - and sent him to jail. Scores of his followers - mainly Buddhist monks - were reciting Buddhist prayers when he was being arrested and packed in the police vehicle. Reports tell us that Sri Lanka is still facing mini-turmoil over this conviction. Marches were organised in different cities of Sri Lanka demanding that President pardons him using his special powers. Protesters have also asked that this revered monk should not be forced to wear jail uniform and be allowed to wear Saffron robes only. For people outside Sri Lanka, it would be rather difficult to understand why a Buddhist monk has suddenly become such a polarising figure in the society there. Remember the courts found him guilty of intimidating the wife of a missing journalist Sandhya Eknaligoda inside the courts itself when he had interrupted a court hearing over the abduction of the journalist, Prageeth Eknaligoda, in which military intelligence officials were accused. He had shouted at the judge and lawyers because the military officials involved in the disappearance had not been allowed bail. Public memory is rather very short but the abduction followed by disappearance of Prageeth had made international headlines then who was investigating the alleged use of chemical weapons against civilians by Sri Lankan army in the fight against the Tamil rebels. (24 January 2010) It was perhaps a dark period as far as journalism inside Sri Lanka was concerned when journalists were intimidated, disappeared or even killed just for being critical of the then Rajapkshe led government's heavyhandedness. Around a year before Prageeth's disappearance the murder of Lasantha Wickrematunge, a senior journalist, by Army Intelligence people had also caused tremendous uproar. "This is a government created by Sinhala Buddhists and it must remain Sinhala Buddhist. This is a Sinhala country, Sinhala government. Democratic and pluralistic values are killing the Sinhala race". [ Al Maeena, Tariq A. (23 February 2013). No doubt Galagoda Aththe Gnanasara or Theo Gnanasara is no ordinary monk. 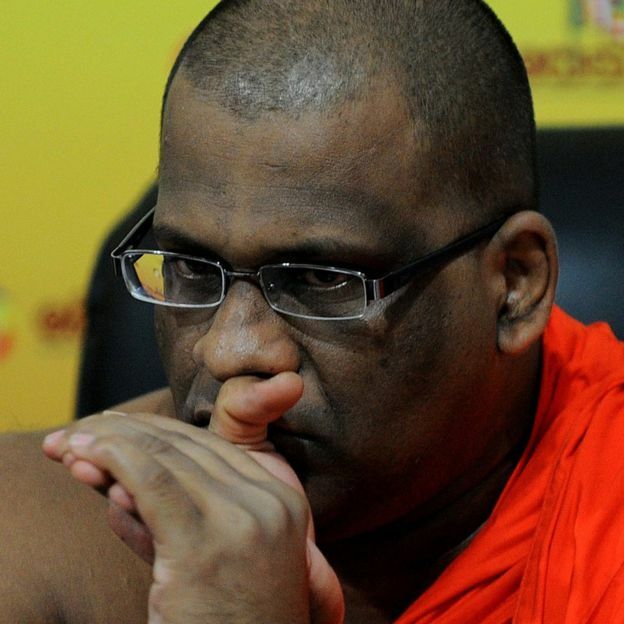 With his latest smartphone, designer glasses and a chauffeur driven car, his look may be at variance with the time honoured image of a Buddhist monk who survives himself in a meager way, but by his intervention in the already fraught polity in the multireligious, multi-ethnic country he has emerged as an influential voice of Sinhala-Buddhist nationalism, which has always been an undercurrent in the trajectory of Sri Lanka. With suppression of Tamil militancy it has discovered 'new enemies' - the religious minorities - as its fresh targets. For it Muslims (7.5%) are target number one but Hindus (15%), who are mainly Tamil speaking as well as the Christians (7.5%) are not far behind. The surge in violence targetting Muslims, their properties and places of worship in March 2018, in district Kandy and adjoining areas, over a minor incident, which prompted President Maithripala Sirisena to declare an island-wide state of emergency was a fresh indication of the simmering tension. The demolition of a mosque near the Golden Temple of Dambulla - a Buddhist cave temple, famous since 3 rd century, part of UNESCO world heritage site - with petrol bombs by a mob led by radical Buddhist monks in the year 2012, claiming that for them it was a 'sacred area' had rather signalled how things would unfold in a post Tamil militancy Sri Lanka. It was then rather disturbing to note that the government had also bowed to the mob’s demand and ordered the mosque’s demolition and relocation. It did not matter to the ramapaging mob that not only the mosque but the temple as well as church there were decades old and had been constructed on the land by taking valid permission from the concerned authorities. "Sri Lankan authorities to act immediately to end attacks on Muslims in the country, and to rein in violent groups that target religious minorities, and take action against perpetrators." and its focus was on Bodu Bala Sena only. Providing details of violence and intimidation against Muslims, including petrol bomb and mob attacks on mosques, businesses and homes that have resulted in extensive property damage and the failure of the police to prevent these attacks it had specifically mentioned role of Buddhist monks associated with Bodu Bala Sena who "..[a]ttempted forcible land grabs in eastern Sri Lanka, and the media has reported a series of provocative and religiously charged speeches by BBS leader Gnanasara Thero." It has said how Gnanasara Thero's hate speech vis-a-vis Muslim Rohingya refugees had created tension and how petrol bombs were thrown at a mosque when a BBS procession was stopped by police which was fourth attack on a mosque since mid-April. "According to it, anti-Muslim violence in the town of Aluthgama claimed four lives and substantial property damage after speech by a BBS leader ( June 2014). Bodu Bala Sena leader Galagoda Aththe Gnanasara is a man whose words lead to action. When he threatens Muslims in a speech, mobs ransack Muslim neighbourhoods. And people die. It would be important to watch how the whole issue of Thero Gnanasara's arrest unfolds : whether the present President Sirisena would succumb to the pressures being exerted by Sinhala-Buddhist Supremacists to release him or would allow the law to take its own course. For him it is rather a difficult choice to make looking at the fact that the earlier President Mahinda Rajapakshe and his brother Gotobhaya had facilitated emergence of Bodu Bala Sena. When Mahinda Rajapakshe was still holding reins of power the country, Gotobhaya was the chief guest at the opening of the Buddhist Leadership Academy floated by Bodu Bala Sena and heaped praise on them for their "nationally important task". Any such principled stand by President Sirisena can definitely damage him at political level and benefit Rajapakshe whose party won big in the local elections held few months back. And it would not be an exaggeration to say that it would have regional implications because the import of Gnanasara and his brand of politics is not limited to the island nation alone. Words and actions of Galagoda Aththe Gnanasara can remind people of saffron robed monks/priests/Babas on this side of the border belching out similar hate speeches and calling for violence against the minorities here. One can discover an eerie of similarity between how the Sinhala-Buddhists militants and the Hindutva Supremacists talk, act and think on similar lines. And much like them there is hardly any action against them here. If the Sinhala-Buddhists believe that they are part of the "Aryan Sinhala race" and Sri Lanka is their home land, the mission of protecting Buddhism has been entrusted to them by Buddha himself and Sri Lanka is the home for Sinhala language whereas their Hindutva counterparts talk of making India a Hindu Rashtra and pushing the non-Hindus to a secondary status of citizenship. An ideologue of this vintage even writes in his book that they are the 'internal enemies' of independent India. An important feature of the Sinhalese that has influenced their attitude to minorities is that they are, as noted Sri Lankan anthropologist Stanley Tambiah described in his book Sri Lanka: Ethnic Fratricide and the Dismantling of Democracy, “a majority with a minority complex.” Thus although Sinhalese vastly exceed Tamils and Muslims in terms of numbers, they feel outnumbered by them. They see the island’s Tamils, for instance, as part of the larger Tamil community in the Indian state of Tamil Nadu and the Sri Lankan Muslims as part of the Muslim ummah. This “minority complex” has resulted in Sinhalese viewing themselves as victims, who have to act, even violently, to defend the island and Sinhalese-Buddhist culture from being taken over by the asinhala (un-Sinhala) and abaudha (un-Buddhist). These groups are viewed as essentially “foreigners,” who are staying on the island due to Sinhalese-Buddhist sufferance. If the Sinhala-Buddhists demand that the minorities in Sri Lanka should follow the 'global principle that minorities must reside in a country in a manner that does not threaten the majority race and its identity.” the proponents of Hindu Rashtra think on similar lines wherein they want to ensure that the minorities here should remain at the mercy of the majority or should adopt to Indian (read Hindu) ways. While Sri Lanks celebrates its pluralism and India has formally adopted secularism as a core principle of the Constitution, what one observes on ground that the response of the respective states to the overt and covert violence against the minorities, leaves much to be desired. There are reports galore which show how the state has looked the other way when religious minorities of various dispensation have come under attack or has even connived with the majoritarians and denied the minorities justice. "Bodu Bala Sena - a Buddhist organisation many wish to call as Right or Ultra Right – is a new phenomenon in Sri Lanka. One may prefer to brand them in any manner one would like to. But the fact remains that this new outfit is slowly growing in stature and popular support in the country’s Buddhist-dominated areas." ..."the issues raked up by the BBS are worthy of active and sympathetic consideration. BBS is able to capture the attention of the Buddhist population of Sri Lanka. " It is possible that the way BBS had framed its world view - about 'growing Islamisation and Christianisation of the Island nation' - had stuck a chord with the then Akhil Bharatiya Sah Sampark Pramukh of RSS then who has since shifted to BJP. The rise of Sinhala-Buddhist Supremacism in our neighbouring country and the ascent of Hindutva here around same time cannot be considered an exception at least in this part of South Asia where majoritarian voices/forces owing allegiance to a particular religion or ethnicity are either gaining strength or consolidating themselves. The growing Saudisation of Pakistan or the rise of Islamist forces/organisations in neighbouring Bangladesh underlines how such voices have taken shape there basing themselves on the constructed 'anxieties of the majority community' there. Pakistan seems to be bursting at its seams where various fanatic groups with their violenct acts against the ‘others’ – ranging from the Ahmadiyas, Shias, Hazaras, Hindus etc – have created a situation of implosion. The killing of Shahzahan Bachchu, owner of Bishaka Prokashoni, a publishing house, who was gunned down in his home town in Munshiganj once again brought to the fore the clout Islamists hold in formally secular Bangladesh. (11 th June 2018) It is true that because of a strong tradition of secular movement, situation is seems to be still under formal control of such forces in B’desh ( of course, it is not a great consolation) but that has not stopped it from penetrating deep into the pores of society there. ..[f]undamentalists have created an “economy within the economy” and “a state within the state” They have adequate economic strength (from micro to macro levels) to sustain their political organisations. The economics of fundamentalism, in the narrow sense of the term, can be explained in terms of enterprises ranging from large financial institutions to household level micro credit, from mosques and madrassas to news media and IT, from nationwide trading enterprises to local level NGOs. The estimated amount of annual net profit generated by these enterprises would be US $ 250 million. All these economic enterprises are run by ideologically motivated and professionally competent persons. At least 10 per cent of their net profits are being used to finance the political organisation, which is sufficient to fund the salary of 500,000 full-timers in Islamic fundamentalist politics.. The relative strength of the economics of fundamentalism in B’desh can be traced to the fact that its annual net profit is equivalent to six per cent of the government’s annual development budget and the annual growth rate of the economy controlled by the fundamentalists is higher(7.5 per cent to nine per cent) than that of the national economy ( five per cent to six per cent).. The estimated annual net profit of economic fundamentalism in B’desh would be about US $250 million. The highest share of such profit, 27 per cent (of the total net profit), comes from financial institutions (banks, insurance companies, leasing companies, etc. Explaining the methodology of estimation, Prof Barkat had made it clear that it is largely based on heuristic estimates, but the pattern was indicative of the direction. There was a period in the first part of the 20 th Century when the people in this part of South Asia then under colonial subjugation had fought against the Britishers in their own way and gained political independence.It has been more than 70 years that they achieved freedom but today they are confronted with an altogether different challenge. If one digs further one can as well trace the roots of this situation in the way the anti-colonial struggle was fought or how the tensions arising from the internal asymmetries and fissures in the respective societies could not be properly addressed. No doubt, it is a very precarious situation and if it is not handled properly, the whole region can become a tinderbox of sorts. One can even discern a pattern in the rise of Sinhala-Buddhist nationalism in Sri Lanka, ascent of Hindutva Supremacism in India or Political Islam taking its strides in Pakistan as well as Bangladesh. Situation unfolding in neighbouring Mynamar, explains how this alliance building of sorts between various exclucivist/sectarian ideologies/formation is taking shape. Mynamar, as everybody knows is making headlines the world over because of the plight of Rohingya Muslims, which is developing since last few years. Many reports have appeared detailing the role played by the army in the ethnic cleansing of the hapless citizens, burning down of their villages and the silence maintained by the likes of Aung San Su Kyi . And here also the role of saffron robed Buddhist monks has come under scanner, who have been accused of making hatespeeches targetting Muslims, instigating riots etc. e.g Thitagu, a prominent abbot, (head of monks) had in an interview said that “In ethnically diverse Burma, members of different religions should live together like water flowing together”and in the same interview Thitagu warned that “just like the Buddhist host has warmly welcomed other faiths into the country, the guests should strive to get along with the host. They should not trespass on the host’s goodwill and take over the home”. Of course, the most controversial among them is Wirathu . ‘Guardian’ had done a special story on him few years back who with his 2,500 follower monks has become a dreaded name in the country., instigating Buddhist fanatics to attack Muslims. Attempts to coordinate activities against a ‘common enemy’ had received a boost when the infamous Wirathu visited Sri Lanka and a proposal was put forward by Wirathu and BBS jointly seeking Hindutva Supremacists nod to form what they called a “Peace Zone”. ..The time has come to ally internationally,” Galagodaththe Gnanasara, the leader of the radical Sri Lankan Buddhist group Bodu Bala Sena, announced at a convention held in Colombo last month. The guest of honor was Ashin Wirathu, a Buddhist radical whose picture Time magazine put on its July 1 cover as “The Face of Buddhist Terror.” The government of Prime Minister Mahinda Rajapaksa ignored pleas by Sri Lankan Muslim and Christian civil groups, fearful of more anti-Muslim violence in their country, to deny Mr. Wirathu a visa. Granting Mr. Wirathu a visa can only reinforce the fears of many Muslims that the government — and perhaps more powerful regional allies — back Bodu Bala Sena, which translates as Buddhist Power Force. Last week, Mr. Gnanasara claimed he was in discussions “at a high level” with the right-wing Indian Hindu group Rashtriya Swayam Sevak to form what he called a “Hindu-Buddhist peace zone” in South Asia. A Rashtriya Swayam Sevak spokesman, Ram Madhav, promptly denied that there were any such discussions. But Mr. Madhav, now general secretary of India’s governing Bharatiya Janata Party, has written comments sympathetic to Bodu Bala Sena and Mr. Wirathu’s group 969 in Myanmar on his Facebook and Twitter accounts. The plight of Rohingya Muslims has become a cause of international concern. The military in Mynamar has provided tacit support to their ethnic cleansing of the hapless minority. "This statement remained silent on the mass cleansing of the Rohingyas but expressed grave concern on the ‘terrorist’ activities of a section of Rohingyas in self-defence. In a more shocking development the RSS/BJP Indian Government has issued instructions to deport nearly 40,000 Rohingyas, who escaped to India while under attack, for being a security threat. How does one understand this silence? As the dictum goes : Silence speaks and in this case also should we say that the silence of the Indian rulers over the mass cleansing of Rohingyas spoke a lot. Forget Rohingyas. And the Indian rulers for a moment. Why did the conviction of Thero Galagoda Aththe Gnanasara could not become a news here? Rarely does Sri Lanka convicts monks but when judicial history of sorts was made in the neighbouring country why did the media here kept mum ?